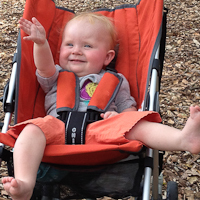 At 11 months, Hazel is on the verge of erupting into speech, but for now she has just two words: "hi" [wave] and "da" [point]. "Hi" [wave] seems to have a completely conventional meaning. Hazel waves and says "hi" when she sees people for the first time or has not seen them for a while. 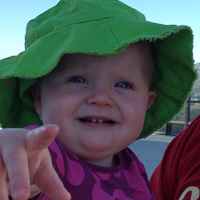 As we climbed the path to the Griffith Observatory, Hazel greeted strangers coming down with "hi" [wave]; when Will and I arrived for dinner, she welcomed us with "hi" [wave]. So "hi" [wave] seems to mean "hello" in the normal way. It is Hazel's way of acknowledging others and inviting them to acknowledge her, which they invariably do. "Da" [point] is more complicated. "Da" [point] refers to what Hazel sees, but what it indicates is an open question. It almost certainly can refer to individual people or objects — like her father (the proto-da) or Darby the cat, but it also seems to refer to more complex objects like a babbling stream or the palm trees passing by outside the car window. As we sat in the back of the car on the way to Huntington Beach yesterday, she pointed and said "da" about a hundred times. Sometimes it was obvious that she was pointing to the ceiling light or Anselm's water bottle, but at other times I could not tell if she was pointing to the window, or the label on the sunshade on the window, or the sky outside the window, but I assumed she was pointing to something. When I say "something", however, I have to imagine that something to her is not like something to me. All my somethings are divided into categories with names attached to them while Hazel's (presumably) are not. I say presumably because she is not entirely innocent of language. If I ask her where Panda is or where her book is, she can crawl to the toy box and pull out the right thing — which means that she can pull out the wrong thing as well. But when she speaks, she cannot make a mistake. So long as everything is designated by "da" [point], she is as free of fault as Adam and Eve before they ate the forbidden fruit. It is clear from her gestures that the contents of Hazel's visual field are differentiated, but all the things in it are "da" [point], except those that are "hi" [wave]. I wonder if this could be the germ of the idea of an external world that includes people — the "hi" [wave]s — and things — the "da" [point]s.